You'll be £25.00 closer to your next £10.00 credit when you purchase Christmas Collectables. What's this? Whether it's the Christmas baubles and figural tree lights you used as a child or special ornaments and crockery specially created to celebrate the festive season, Christmas collectables appeals to many types of collectors, as well as those who recall their own Christmas celebrations with nostalgia, little realising just how valuable and desirable some of their own festive goods have become. Collectables expert, Tracy Martin, has divided this beautifully illustrated book into different types of Christmas collectables, including Father Christmas, Christmas decorations, crackers, cards, ornaments, jewellery and even Christmas trees themselves, such as the highly desirable feather versions which date from 1845. Tracy has delved into Christmases past, present and even future to reveal the best collectables and how to spot future seasonal best-buys. Full of practical advice and a directory of specialist dealers, her top tips include how to avoid being caught out by later reproductions and modern fakes. 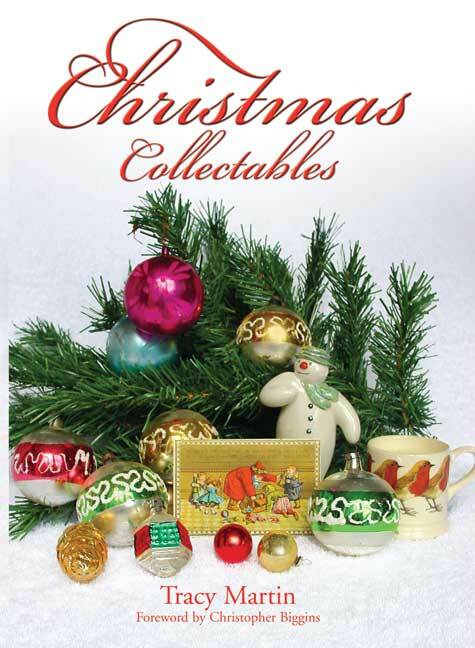 This is a must-buy book for anyone interested in Christmas collectables, whose own collection, whether teapots, books or toys, overlaps the Christmas market and everyone who loves Christmas and wants to discover more about the festive period and its traditions. Tracy Martin admits to an appetite for Christmas that extends beyond the festive season. Her book comprises twenty one chapters which cover everything from late Victorian artificial trees, lights and decorations, ceramic items, snow globes, Santas, snowmen, crockery and so on.